Beverly's Official Blog | News and findings from world of crafts, scrapbooking and more: Some Goodies for You! We're always brainstorming for new ideas of projects to bring you, and we thought we'd like to hear from you about this. What's your favorite craft and/or what kind of projects would you like to see? Leave a comment and you'll automatically be entered in a drawing to receive one of these two goodie bags. 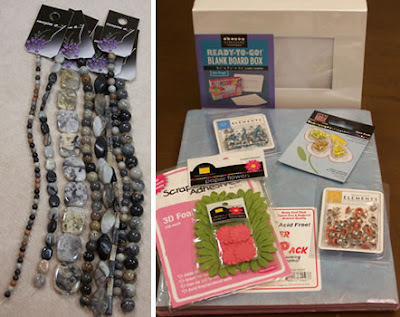 (1) beads from Imagine It, or (2) random goodies: including a blank board box, some paper, eyelets and some florals. So get heard, and maybe you'll get some goodies! We'll announce the winners tomorrow afternoon. Some lacy sort of knitting project would be fun. I love scrapbooking, paper or digital. I also love making cards--it's an easy way to use those scrapbook supplies and do something for someone else at the same time! jewelry would be a great summer project for my step-daughter this summer including scrapbooking. we luv! Anything to do with scrapbooking and card making. I can't get enough!!! And I always enjoy new ideas and techniques! I love to sew and love jewelry so anything with those two would be great. I'm trying to make my own luggage tags for vacation. I love papercrafts and beading, things that make little gifts and favors for friends and family. Always looking for something new and different. Papercrafting is my favorite. Anything to do with paper arts.... folding, cardmaking, punches, QuicKutz dies, etc. I love scrapbooking, but always looking for anything altered. Gifts for teachers, etc. I'd like to see lots more scrapbooking. Layout designs and new products! I lead craft classes for children in my daughters' 4-H group, and would love papercrafting ideas that are fun and kid-friendly. I love our store! I wish there was one closer to me! I love working with seed beads most of all! LOVE Beverly's, don't know what I'd do without it. I recently started making jewelry for my family and friends, and I love it. It is such a thrill to look at a piece of jewelry and know that I created it from beginning to end. I would like to see a more varied selection of jewelry making brands...Manor House and Artistrywear, for example. i love scrapbooking. so some projects involving scrapping techniques would be awesome. For many years my favorite craft has been card making; I just never get tired or burned out with so many new techniques, stamps, papers and embellishments coming out all the time! I love altered mini books and fun sewing projects. I am a quilter so I would have to say any fun project with all those wonderful cotton prints.....Aprons?? Quilt block Pot holders? Pincushions?? Fun stuff like wallets or tote bags? How about a stocking for Christmas in July?, Folded fabric flowers (sooo lovely in batiks), yo-yo things!! Ling the yo-yo doll and animals or embellishing a tote with yo-yo I just love yo-yoing with those new clover thingys. and card making. I just love paper! I like to crocheting. I have a 3months old baby Emily and need some projects for her: hats, ckirts, and dresses. I am a long time craft-a-holic and love EVERYTHING!!! How about using a theme such as wedding or baby and give us projects for all genres? (Crocheted garter belt, decopauged frame, stamped cards, afghan or quilt, wedding favors, etc)Simple yet elegant always works and may encourage us to learn a new craft. I love scrapbooking, stamping, crocheting and anything crafty! I could use more ideas in card making. I love to connect with friends and family with something I made myself.